The Follett Challenge launches its eighth annual contest today and this year’s entrants will have additional incentive to capture the Grand Prize. In addition to winning $60,000 in Follett products and/or services, the winning school will receive a personal visit from Kwame Alexander, one of the country’s most acclaimed children’s book authors, as part of the award celebration. Alexander, a New York Times bestselling author and Newbery Medalist, also will serve as a judge for the 2019 Follett Challenge, which is open now for entries through Dec. 14. Follett will award a total of $200,000 USD in products and/or services to schools/districts with innovative educational programs. All public and private K-12 schools/districts in the United States, Canada, and Australia are eligible to apply. 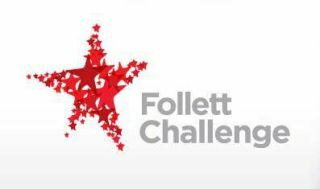 Follett Challenge entrants must complete an online application and submit a video describing their program outlining how it has made a positive impact on their school. Three semifinalists are to be selected—one each from the elementary, middle and high school categories—and will earn $30,000 prizes. The Grand Prize winner, to be selected from the three semifinalists, receives an additional $30,000, plus a visit from Kwame Alexander. Ten $8,000 prizes will be awarded to People’s Choice winners, which are those schools receiving the highest number of online votes from the public for their submitted videos.